The new Jeep Renegade got restyled for the 2019 edition. The result is a vehicle that oozes out style with a beaming personality, raising its value more than ever before. Jeep as an age old Brand known for conceptualizing SUVs, maintains its heritage structure by weaving it into each body panel. All this is to bring out the ruggedness in its exterior appeal. Once again, the Renegade looks refreshingly bold and undeniably beautiful. If you step in the Bridgman Chrysler Dodge Jeep Ram dealer, the sales team will be more than happy to show you the exclusive features of the 2019 Jeep Renegade that are clean exhibitions of its capable intentions. Brimming with style the 2019 Jeep Renegade conquers the road no matter what challenges are thrown towards it, thanks to the varieties of wheel options that range from 16- to 19-inches, as per your choice. When the 2019 Jeep Renegade rolls in, it will steal the show for sure, with its newly added available LED Lighting Group that features a pair of premium LED Head and Tail lamps that sport an LED signature ring along with eye-catching LED fog lamps. The exterior gamut of the 2019 Jeep Renegade can be enhanced with the newly installed open-air My Sky Removable Panel Sunroof that holds a pair of roof panels that are easily removable letting the natural atmosphere overpower the artificial one. The panels can store a height-adjustable rear cargo area after it is removed. The new 2019 Renegade can now boast out loudly with its aggressive scene-stealing looks that is derived from the smartly redesigned front fascia, new grille vents that add further spice to the sporty spirit of the new 2019 Renegade. Step inside the 2019 Renegade, and the new adventure begins. Continuing the flow of aesthetics from its robust exterior, the interior sets a mesmerizing contrast of softness harnessing premium features and upholstery. You get to enjoy an advanced user-friendly infotainment, massive and diverse storage options, enhanced interior functionalities like an open-air sunroof, Dual-Zone Automatic Temperature Control, heated front seats and steering wheel. To keep you entertained, Jeep has installed the best in class BeatsAudio Premium Sound System that booms with high grain sound quality. For 2019 Jeep has charged the Renegade with two fun-fueled and refreshingly efficient engines. One is the 1.3L MultiAir Turbo engine and 2.4L Tigershark MultiAir engines, that do not allow anything to stand against your spirit of adventure, irrespective of the engine option you go with. To add to the flavor the 4×4 systems pushes up the towing capacity up to a ton, that makes the 2019 Jeep Renegade even more desirable, if you are more prone towards the utility aspect of a car. 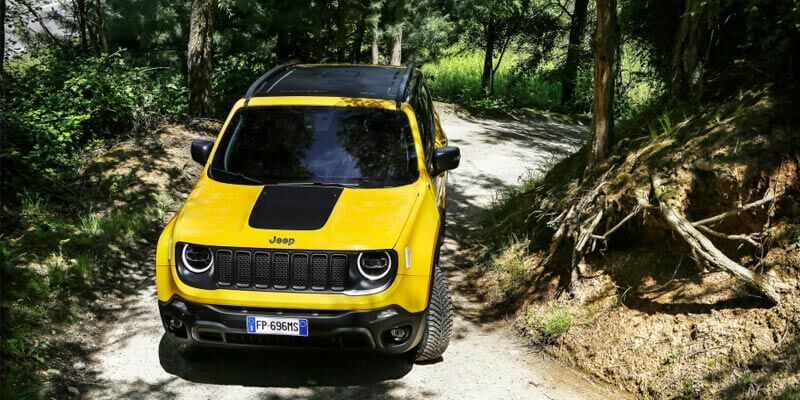 With the Trailhawk feature on board, the 2019 Jeep Renegade stands out as one of the most capable models in its class. The curled up front fascia after the redesign, makes a more aggressive approach and an improved clearance at the front-end while the red tow hooks in tune with that black hood decal reassures that the 2019 Jeep Renegade is an off-road master. To experience it of your own, book a test drive at Jeep dealer Serving Bridgman today.